Since 2008 we have been following the Australia/New Zealand cruising market with some interest as it continues to grow. The market seems first to have come to attention when Australia was not hit as badly by the 2008 recession that caused havoc in Europe and North America and has since taken on a life of its own. And in a market that has only a low 1.5% penetration it seems that there is still further room for growth. Elsewhere, the Norwegian Star gains 58 cabins, Galveston gains a new cruise line and Singapore gains a floating maritime museum. Last year, on February 22, we wrote about a "Boom Down Under" in cruising. Then on December 27, we brought readers up to date with the fact that Australia would now have six full-time cruise ships based there, split between P&O, with four, and Princess Cruises, with two. Australia has also benefitted from the demise of Ocean Village, whose two ships operating there means that all three of the last Sitmar ships are now based down under. On January 17 this year, we carried news that Carnival would abandon San Diego to send its Carnival Splendor down under, to make it seven full-time cruise ships based in Australia and New Zealand. And now, only a few weeks later, we have news from Celebrity that it is sending one of its best ships down under while Holland America will open an office in Sydney. 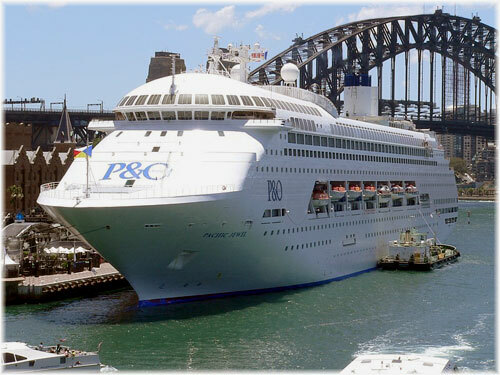 A year ago, David Dingle, ceo of Carnival UK and Australia, revealed that twelve ships from P&O Australia, P&O Cruises, Princess Cruises, Cunard Line and Yachts of Seabourn would be visiting Australia in 2010 and that half would be based there. He forecast that Carnival Australia would book 190,000 passengers in 2009-10, 300,000 in 2010-11 and 350,000 in 2011-12, an increase of almost 85% over two years. And this does not include Carnival and Holland America, who maintain their own overseas representation. Now, Celebrity has announced that it will send its Celebrity Solstice, name ship of her class, to Australia and New Zealand for the 2012-13 season. Celebrity had only recently announced a return to the Australasian market with Celebrity Century later this year, and changing from an 1,800-berth to a 2,852-berth ship will mean a 55% growth in berth capacity for Celebrity's operations down under. Celebrity Solstice will undertake a series of 12- and 13-night cruises between Sydney and Auckland, and a circumnavigation of Australia with two cruises operating in each direction between Sydney and Fremantle. Her positioning voyages at the end of the 2012 will be from the Mediterranean via the Suez Canal, Dubai and the Far East, offering more opportunities for the Australasian fly/cruise market as well. At the same time as Celebrity was announcing its news, Holland America Line revealed that it would be sending its Vista class vessel Oosterdam to the South Pacific for the 2012-13 season, upping its own capacity by 25%. At the same time it announced that it would be opening a branch office in Australia. 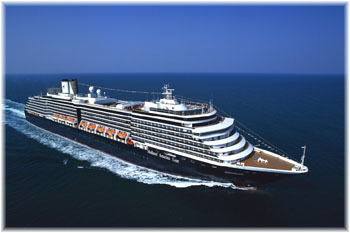 The 1,932-berth Oosterdam will replace the 1,440-berth Zaandam and will work alongside the 1,440-berth Volendam. Holland America's Australian office will be located alongside that of Carnival Australia but with its own sales, marketing and reservations teams. This is all happening in a market where only 1.5% of the population have taken a cruise, compared to 2.4% in the UK and 2.3% in Canada so there is sure to ne more news coming from down under. Other recent news has Norwegian Cruise Line's Norwegian Dawn would be going to the Grand Bahama Shipyard in May to received twenty-eight new suites and thirty new inside cabins, which at two berths to a cabin would add over 5%, to her 2,244-berth capacity. The suites include four 667 to 732 sq ft deluxe owner's suites and 24 family suites, ranging from 408 sq ft to 495 sq ft. As most can actually sleep six passengers this adds to the increased passenger load. It was an executive from Grand Bahama Shipyard who pointed out that on average each additional cabin is worth about $100,000 in annual revenues, so on that measure the Norwegian Dawn's new accommodations will be worth at least $5,800,000 a year to NCL. (See The Cruise Examiner for October 4, 2010, "An Extra $100,000 Per Cabin," for more on that subject). The Norwegian Dawn is a sister ship to the Norwegian Star, work on which provided the basic ideas that are now being carried through on the Dawn..
As the Norwegian Star leaves the West Coast for Tampa, Princess Cruises has announced that after a five-year abscence, it will be returning to Galveston, across the Gulf, with its 3,070-berth Crown Princess, which will be based there for the winter of 2012-13. Galveston has already gained a big ship from Royal Caribbean International, whose 3,114-berth Mariner of the Seas will leave the Mediterranean at the end of the summer for Galveston, where she will work the 2011-12 winter season. Although cruising is relatively new to Galveston, the port is no stranger to passenger ships. For the decades between the Civil War and the outbreak of the Second World War, the Mallory Line maintained regular direct service between New York and Galveston with calls en route at Key West. The Mallory Line's last surviving ship, meanwhile, is the former Medina, launched in 1914. She later became the Costa cruise ship Franca C and in 1978 the mission ship Doulos. 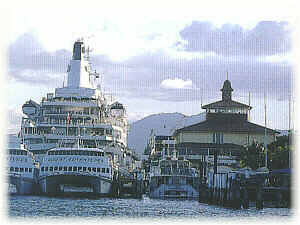 Between 1953 and 1977, the Franca C was one of Costa's pioneer ships, having crossed the Atlantic to South America and the Caribbean, cruised in the Mediterranean and out of Port Everglades, Florida, in the 1960s, and operated one of the first fly/cruise programs out of San Juan, Puerto Rico, in 1966. Withdrawn from service in 2010 because of new Safety of Life at Seas (SOLAS) regulations, the Doulos is now in Singapore, where as the Doulos Phos she is being converted into a heritage maritime museum. This pioneer cruise ship, converted from a cargo ship and then migrant ship, now looks reasonably certain of reaching her 100th birthday in two years' time.